Regular readers will have noticed the blog has been rather quiet for the first six months of 2017. There’s a reason for that – the letter right arrived in my inbox on January 5th. Reading it was both a moment of elation, and also a stern wake-up call. 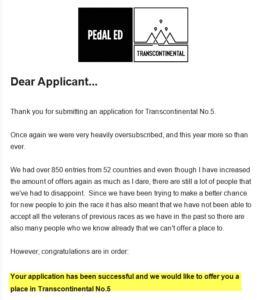 An immense and sudden ground-rush of hopes and dreams about taking part in an ultra-endurance cycle race. 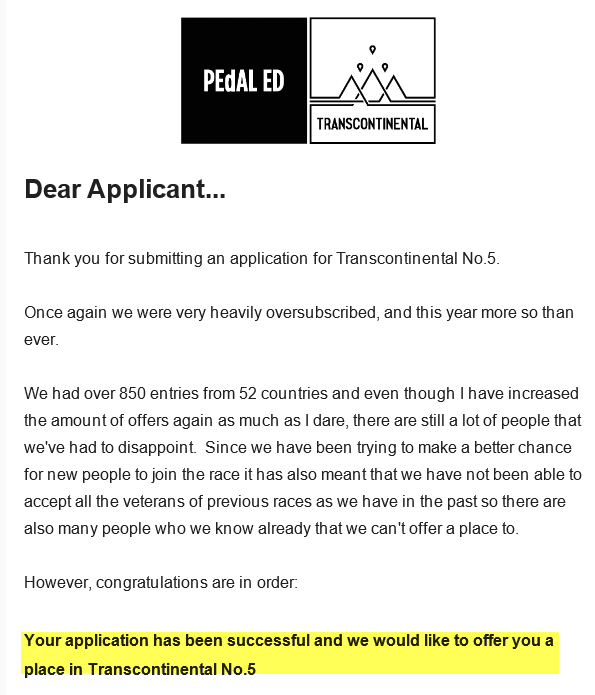 It was actually going to happen, in seven months’ time, ready or not, I’d be lining up to start #TCRNo5 (the PedalED Trans Continental Race No5). And it’s that getting ready part which has dominated every scrap of spare time since – kit planning, route planning, physical and mental preparation, and generally stressing out over what is too come. Hence the lack of activity here on the blog – eat, sleep, family, work, TCR prep. The small amount of time I did carve out for some writing was taken up with the July RIDE Magazine article marking the 20th anniversary of Audax South Africa (more on that in a future entry). But now, two weeks before the start, I find myself sat on a plane to Joburg. With no WiFi, and actually very little left to do anyway, I can finally catch up and recount some of what’s been occupying my time. So for this first part, let’s look at the kit I’ve chosen to ride with, and why. Right is a picture Yoli took last week on my practice packing run. It was meant to be absolutely everything I’d be taking but (as someone pointed out mere nano-seconds after it went on Facebook) it’s missing my shoes, and water bottles. Everything else is there though. At the bottom of the entry is a link to the complete list, but let’s discuss a few of the things I’ve chosen to take, or leave out, and the reasoning behind it. There’s a ton of other kit lists published by other riders, and a fair amount of overlap in obvious areas (e.g. bike, rider, helmet) – but there’s also a massive variation when it comes to details. 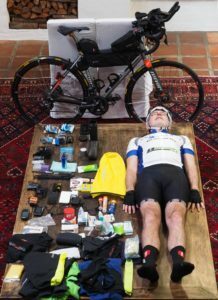 And that is probably the hardest part of the whole kit planning and testing process – figuring out what you need, what works for you, and what will just be excess baggage. There are no right or wrong decisions here but, endurance racing being a mental game, whatever you pick has to help give you confidence. Riding with kit someone else recommends but you’re not sure on is a recipe for second guessing and doubt – two of the worst enemies for a solo rider, miles from home or civilization and battling to keep mind and body pointed in the right direction. A Niner RLT9 Steel – almost the first decision I made, and one I’ve pretty much never questioned. A couple of club mates have expressed concern over the weight compared to a light carbon rig. And sure, I could save a kilo or so maybe, but every time I get on the rig and ride I calm down, settle into my pace, and relax. It’s a rig built for distance, and it’s by no means slow on flatter or rolling terrain. Most importantly, it’s a rig I can (and have) ridden all day, day after day. Comfort is aided by the lush seatpost, and trusty saddle (the same model graces all bar one of my bikes). Perhaps the biggest surprise has been how fast and smooth rolling the 30mm Schwalbe rubber has been. I expected larger tyres to carry a penalty but honestly, they fly along and soak up the road while doing so. Wheels? – hand laced by William from his eponymously named LBS (William’s Bike Shop). Contentious discussions have been had around mudguards (fenders) on the TCR Facebook discussion group. All I can say is they weigh next to nothing, and if they keep at least some road grime off me or the drivetrain then for me they’re worth it. Di2 gearing is something of a luxury but, together with the hydraulic brakes (a late decision) also add a vital element of control later in the race as the inevitable hand palsy sets in and gripping power starts to fade. Keep it simple – one change of shirt and shorts, warm base layer and light fleece for the mountains, and jackets and boot covers for the rain. Even if I wanted to carry more I don’t have the space. It’s going to be an interesting challenge doing laundry in hotel sinks and showers, so I (along with 300 other riders) are going to develop a fairly rich aroma by the time we reach Greece. At Yoli’s insistence I have put a small deodorant in – which I’ll be losing at the first opportunity and going with enjoying my natural odour. Drugs? Yep, plenty of those. Apparently for health reasons we shouldn’t be taking too much Vitamin-I (Ibuprofen) – so I’ll be kind to me kidneys and try and avoid them. When the pain goes off the chart though, you need something. I know it’s completely possible to ride TCR without a dynamo – and I may only use mine as a backup anyway. But having it there gives the ability (and confidence) to be able to just keep riding, without worrying about my lights dying or needing to find somewhere to charge my phone, Wahoo, or Garmin. The actual dynamo hub and rims became a saga in their own right. Firstly finding decent 32 hole clinchers in South Africa. Honestly, William’s persistence at this was epic and the result was a wonderful (if a tad pricey) set of hoops. No sooner had they been built than I learnt of problems with the model of dynamo I had chosen. I fretted for a couple of days, before receiving one of the best and most generous examples of customer service I have ever experienced. Shutter Precision in Taiwan shipped me the replacement model, with more resilient bearings, completely free of charge. I’d have expected that if mine was actually broken, but at the time it was rolling fine and I was just a customer concerned about how they’d handle TCR. I’m not sure how many other firms will replace a fully working part with another one just to alleviate a worrying customer. But these guys did, and earned a supported for life! Yep – as the list shows, I’ve probably overdone it in this department. As Yoli knows too well, I’m an incessant over-planner and over-packer. I’ve got stuff for contingencies that may never happen, and backups of my backups. It adds weight I could probably avoid, but it also puts my mind at rest. Remember the importance of that mental part? I guess the main omission, and one I have wrangled with myself over, is not taking a bivi. It’s not huge, or that heavy, but my space is short. The primary reason though is that my ride plan is to sleep in hotels wherever I can. It will probably cost me a bit of time, but the plus side will be a better night’s sleep in a real bed. I’m sure in some places I will strike out – and for those I have an emergency blanket and silk sleeping bag liner. There is a secondary reason for not planning to sleep outside, and that is keeping my immune system as intact as possible – last thing I fancy is waking up realising I had unwittingly dossed down in a fog hollow, and am now on the way to some bronchial condition. Paranoia I’m sure, but hotels it will be for me. And, thanks to Yoli’s amazing packing skills it all fits into my meagre luggage space. I look at other people’s rigs and marvel about how they seem to fit twice as much in with fewer bags and less weight. But they aren’t me, and I’m not them. Oh, and yes, I do spot the obvious flaw here. Whilst she can help me now, in the spirit of unsupported cycling , Yoli cannot actually pack for me on the road (not that she is there anyway). So somehow, I have to remember how it all fits in. Easy on day 2 or 3 probably, but by day 10, sleep deprived and lacking energy and co-ordination? That’s going to be a whole other question – and all part of the adventure. As every long distance cyclist knows, the time to worry about day 10 is as the last minutes of day 9 ebb away. Until then, it’s a problem somewhere down the road – only in need of solving when we get there.